[ Catherine Stepney, Lady Stepney, 'Silver Fork' novelist. ] 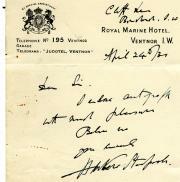 Autograph Letter Signed ('C Stepney'), inviting 'Mr Westmacot' [ Sir Richard Westmacott or his son ] to a reunion. With engraved portrait of her by A. E. Chalon. The letter is 1p., landscape 12mo. In fair condition, with light signs of age, placed in a windowpane mount in the remains of a leaf from an album. The letter reads: 'Dear Mr Westmacot [no doubt the sculptor Sir Richard Westmacott or his son] - I have a little reunion - on Monday evening 1st Feby - pray come - I am desired by <?> to present you to her especially - that she may invite you to her next Fete'. The engraving is on a 21.5 x 13.5 cm piece of paper. Similarly-mounted as the letter, above it on the same leaf. In fair condition, lightly aged and worn. [Mrs Gore, novelist ] Autograph Manuscript of part of one of Mrs Gore's "Tales", "La Tarantula" (variously spelt!). originally published in Tait's Edinburgh Magazine. Tait's Edinburgh Magazine, 1836, vol.III, pp.163-173 as "La Tarantala"
Autograph Manuscript,, 1.5pp., 4to, sl.wear and tear and edge stained, text clear, light authorial corrections. The text derives from pp.171-2 (Tait's) from "interrupted her companion, tightening his grasp of her slender waist [ ...] do more for his bride". Four authorial additions or changes. 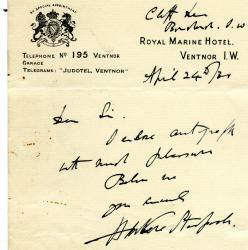 [ Arthur Morrison ] Autograph Note Signed "Arthur Morrison" to "Fraulein [Clausen?]" about translation of his work into Geman. Arthur Morrison, novelist (working class life and detective fiction). [Headed Notepaper] Salcombe House, Loughton, Essex, 8 August 1902. One page, 8vo, bifolium, fold mark, good condition. "I am obliged by your letter. Some of my books have been translated into German, but not all. My agent, Mr Watt [A.P. Watt], who transacts all my business, is at present away on holiday, but I will send him your letter and ask him to communicate with you on his return." No place [ Abbotsford ]. 'Wednesday Morning' [27 November 1826?]. Autograph Note Signed 'Will. H. Lizars' on receipt of payment for work on Walter Scott novels. [ William Home Lizars ] William H. Lizars (1788–1859), Scottish painter and engraver. One page, 21 x 8cm, one dge frayed and sunned, text clear and complete. Lizars acknowledges paymentof £49.14 from "John Gibson Junr, Esqre for the Trustees of Sir Walter Scott, Bart [...] payment of [annexed?] account [not present] for Titles to Tales & Romances." [Terry Pratchett] Eight Typed Letters Signed or "initialled" (a squiggle) to Sally Worboyes of Fen Farm Arts Ltd (seminars for would-be writers, Pratchett being one of the well-known tutors). Eight typed letters, total nine pages, 4to, varying in length from 2 or 3 lines to a page and a half. [continued title] on The Present Crisis and the Battle of Armageddon; togther with Strictures on the Pamphlet 'The Coming Struggle'." 32pp., 8vo, printed wraps, edges stained, spine with residual string from binding in, minor damage, contents good condition. "The Coming Struggle" which is a target for this pamphlet, is ascribed to Scottish sensation writer, David Pae. Scarce: COPAC lists copies only at the major libraries (NLS, BL, CUL, Oxford). 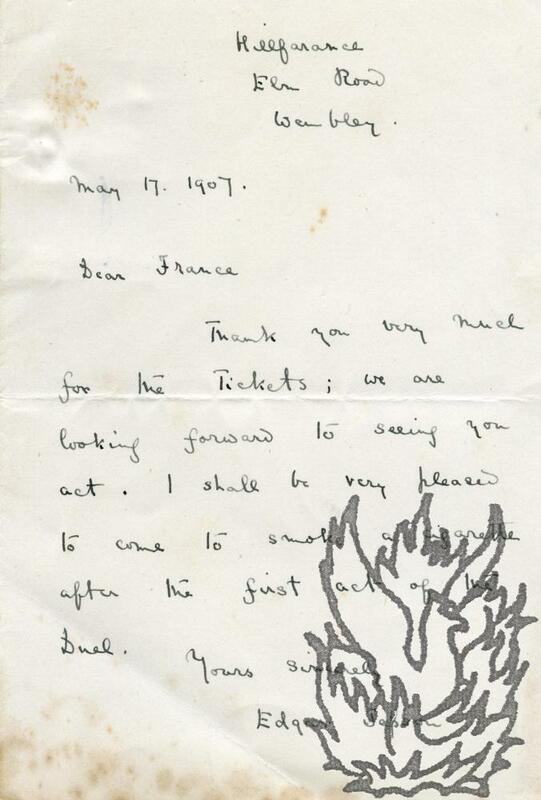 Two Autograph Letters Signed to 'Dear France'. 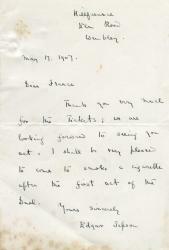 Letter One: 17 May 1907; Hillfarance, Elm Road, Wembley. Letter Two: 29 June 1907; 23 Bath Road, Bedford Park. London W.
Autograph Card Signed ('Agnes Castle' and 'Egerton Castle'). 6 December 1901; place not stated [Brighton]. Printed Post Card, dimensions three and a half inches by five and a half. Good, on aged paper, but with the reverse (showing the remains of a photograph of Brighton) damaged by its removal from an autograph album. Unobtrusive vertical crease. Reads (apparently in Egerton Castle's hand) 'Dear Miss Gray | Your letter has been forwarded to us here. We have much pleasure in sending you the autographs you desire'. Scrapbook collection of newspaper cuttings and illustrations relating to Harper's book 'The Hardy Country'. Harper (1863-1943) was a writer and charming 'pen-artist'. His 'The Hardy country: literary landmarks of the Wessex novels' was published by A. and C. Black in 1904 and reprinted in 1911 and 1925. Quarto scrapbook of approximately fifty leaves. Leather half-binding in poor condition, worn and with much loss to spine. Internally very good, with minor spotting and discoloration. The cuttings, from newspapers as diverse as the Weymouth Telegraph and the New York Post, are mostly laid down, with several on slips of the Author's Clippings Bureau. 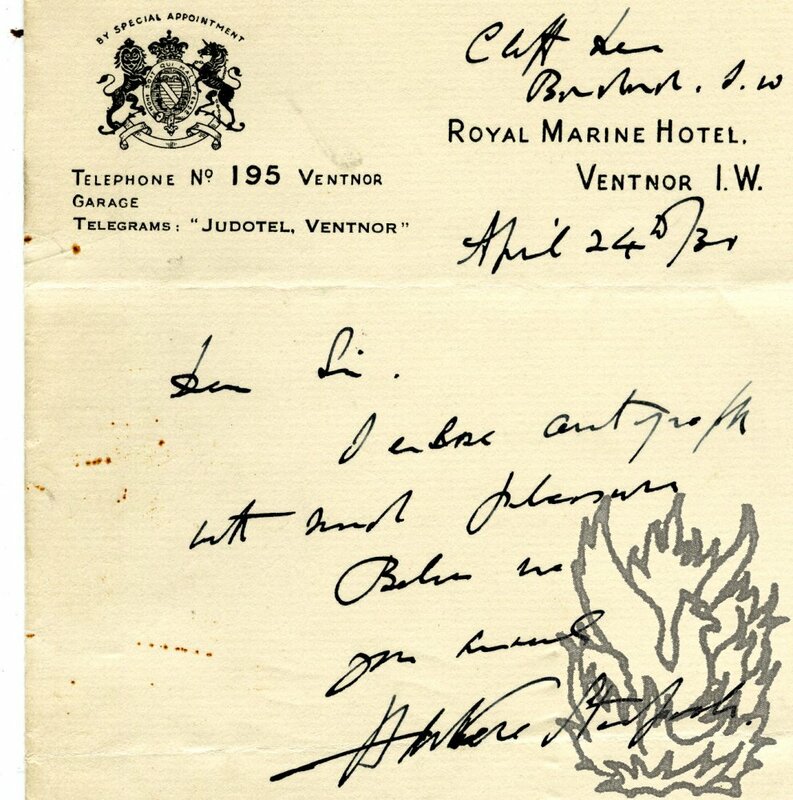 24 April 1930; on letterhead of the Royal Marine Hotel, Ventnor. Autograph Letter Signed [to the Secretary, Royal Society of Arts]. Novelist, short story writer and poet (1884-1954). Two pages, quarto. Very good, though dusty and with small staple holes to one corner. Docketed. Apologises for the late reply to the invitation to join the Society ('the oversight was due to the intervention of leave and other causes'). 'Though I am afraid that I shall not be able to avail myself to any great extent of the advantage offered by your Society, staff members of this Laboratory will doubtless be glad to attend your lectures as they have already done in the past.' Consequently he will offer himself for election. Signed 'F. B.
Typed Letter Signed to unnamed female correspondent. Autograph Letter Signed to [F. J.] Epps[, F.G.S.]. 26 May [no year]; on letterhead 'Old Rectory Ashton Northampton'. English novelist, poet and dramatist (1862-1960), noted for his works on Devon. On piece of paper, 3 inches by 4 1/2. In good condition, and attached to a piece of blue card docketed with list of Phillpots works. Distinctive and attractive signature, 'Eden Philpotts | Feb: 1928'.